Arsenal have been dealt a huge injury blow as Alex Oxlade-Chamberlain is set to be ruled out for a month with a hamstring injury he picked up against Manchester United last night, according to the Daily Mail. Oxlade-Chamberlain was in excellent form against United in the FA Cup quarter final clash at Old Trafford and set up the opening goal for Nacho Monreal midway through the first half. However, the 21-year-old pulled up shortly after the break and was forced off after injuring his hamstring while making a routine tackle in the middle of the park. The Daily Mail claim that the midfielder underwent a scan on Tuesday and the initial feeling among the Arsenal medical staff is that he’ll be out for around a month. 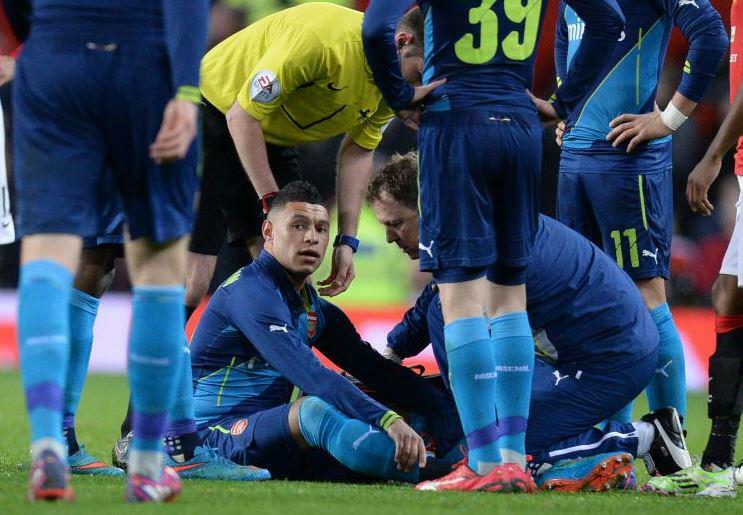 The Ox is due to have further scans on Wednesday to determine the full extent of the injury before any official prognosis is made, but the newspaper suggests that the Gunners will have to make-do without the midfielder for the foreseeable future. Oxlade-Chamberlain is almost certain to sit out Saturday’s visit of West Ham to the Emirates and if he’s ruled out for a month then he’ll also miss the second leg of Arsenal’s Champions League last 16 tie with Monaco as well as crucial league games with Newcastle and Liverpool. The news will come as a huge blow to Arsene Wenger as he looks to continue on three fronts this season and the loss of Oxlade-Chamberlain against Monaco and Liverpool in particular will be disappointing. Arsenal have given themselves a mountain to climb in order to qualify for the last 8 in Europe following a 3-1 home loss while the North Londoners face a crunch clash with the Merseysiders in their battle for a top four finish in the league. England boss Roy Hodgson will also be keen to learn the midfielders situation as a month on the sidelines would also rule Oxlade-Chamberlain out of the upcoming Euro 2016 qualifier against Lithuania and the friendly with Italy.